Devas defy the Progression of Souls. Most souls enter the world, grow during a lifetime, and then move on to the next stage of their soul’s journey. Not so with the deva, who live their life’s journey over and over again without moving on to the next stage of existence. That is, unless reincarnation is part of the gods’ plan. Devas were not seen on Ansalon prior to the War of the Lance. It was in the years following the war that devas first began appearing. Their devotion to the gods and their clothing, reminiscent of the styles of ancient Istar, lend credence to the theory that the devas are actually reincarnated from the true clerics of the gods of Good taken from the world just prior to the Cataclysm. Some scholars theorize that devas have been around since the Age of Dreams. No texts exist to support this claim, though records from this era are scarce at best. Some theologians believe that Zivilyn is the father of the devas. Deva call no lands home. During the rare times that one is encountered, they are seen as wanderers and nomads. Yet strange as it may be, devas from across Ansalon have begun to congregate in the ruins of the ancient City of Godshome. They do not understand the calling. It is upon instinct that they arrive at their new home. A temporary government has been put in place, using a theocracy as a model. While there has been some concern over repeating the mistakes of the Kingpriest, the devas are taking great lengths to learn from his mistakes. 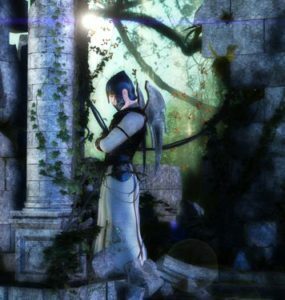 Devas, by their very nature, tend to worship the gods of Good, particularly Paladine. As the exemplar of all that is good, the deva naturally gravitate towards him. Deva who worship Paladine often decorate their shoulder ornaments to look like platinum dragon wings. Devas also worship Habbakuk in his guise of the Blue Phoenix. His message of rebirth resonates strongly with devas. Deva also worship Zivilyn, due to his connection with the River of Time. Some devas consider their life cycle to be a curse of the Tree of Life, while others look upon Zivilyn as their progenitor. No deva worships an evil deity, for such an act would corrupt them and transform them into a rakshasa. Hiddukel in particular is fond of corrupting devas, changing them into living lies, defying the truth of their natural state of existence. Male Names: Baham, Habbak, Korij, Solis. Female Names: Chalah, Kamesh, Nadis.